Welt Online: "America Built the Wall - Kohl is from the East"
"The DDR (GDR - East Germany) was not a dictatorship - the people just had to conform like anywhere else." 24.6% of all students agreed with this statement, 21.1% in West-Berlin and 28.1% in East-Berlin. 54.1% of all students rejected the statement, 60.5% from West-Berlin and 48.6% in East-Berlin. The remainder (21.3% total, 18.4% in West-Berlin and 23.2% in East-Berlin) selected "neutral". "The Stasi (Ministry for State Security of the DDR) was an intelligence agency, just like any other state would have." 31.1% of all students agreed with this statement, 24.4% in West-Berlin and 38.8% in East-Berlin. 49.6% of all students rejected the statement, 56.2% in West-Berlin and 44.7% in East-Berlin. The remainder (19.3% of all students, 19.5% in West-Berlin and 16.5% in East-Berlin) selected "neutral". "I find it good that in the DDR the state took care of all citizens, even though, as a result, individual citizens had less freedom." 26.4% of all students agreed, 17.2% from West-Berlin and 36.3% from East-Berlin. 44.5% of all students rejected the statement, 55% from West-Berlin and 32.9% from East-Berlin . The remainder (29.1% of all students, 27.8% from West-Berlin and 30.8% from East-Berlin) selected "neutral". "The command economy in the DDR was not better or worse than the market economy in West Germany, just different." 20.1% of all students agreed with this statement, 13.9% from West-Berlin and 26.7% from East-Berlin. 43.9% rejected this statement, 51.5% from West-Berlin and 36.3% from East-Berlin. The remainder (36% of all students, 34.6% in West-Berlin and 37% in East-Berlin) selected "neutral". "When was the Berlin Wall built?" 57.6% answered correctly with 1961, 42.4% gave an incorrect answer and named years between 1945 and 1968. There were few East-West differences here. "The Berlin Wall was built by...?" 13.6% of all Berlin students (12.4% West and 14.3% East) answered that it was the Allies, 1.9% (1.6% West and 2.2% East) said it was the USA, 46% answered the Soviet Union (47.2% West and 44.8% East), 4.5% said it was West Germany (3.9% West and 5.3% East) and only 34.9% answered correctly with the DDR (34.9% West and 33.4% East). Former Chancellor Helmut Kohl was identified with the DDR by 13.5% of all students (10.1% West and 16.2% East). 81.6% of all students identified him with West Germany (84.9% West and 80.5% East). DDR Head of State Erich Honecker was identified with West Germany by 8.2% of the students (10.1% West and 6.1% East). Most unsettling are the positive or neutral responses by a majority of East-Berlin students polled (and sizable minorities of West-Berlin students) to the propositions that the DDR was not a dictatorship and that the Stasi was just an intelligence agency like any other. This represents a dangerous ignorance of one's own national history as well as a frightening willingness to condone or overlook the crimes of the former East German regime. Unfortunately, this willingness to overlook the misdeeds of dictators is something that I have experienced firsthand with young Germans. When I asked a young woman protesting the Iraq war and chanting anti-American slogans whether the crimes of Saddam Hussein bothered her - she replied: "Saddam Hussein - what has he ever done to anyone?" Needless to say - her attitudes are closely shared by many young Germans with similar political persuasions. Considering Germany's foreign policy, it is not difficult to conclude that such attitudes - (combined with Germany's reflexive historic pacifism and hyper-sensitivity to casualties) - strongly influence German reactions and responses to the threats posed by present day totalitarians. We have grown accustomed to the common refrain: Downplay the threat posed by the world's most vicious regimes and avoid military engagement at any cost. Note to readers: Special thanks to Karin Quade for bringing this to our attention. Be sure to check out her blog and posting on this. She currently has an interesting piece on how Gerhard Schroeder continues to serve as an apologist for and appeaser of absolutists - this time in China. Also, our creative pause is at an end. As I said earlier - "I'll be back" and now I am - refreshed and stronger than ever - with David Harnasch to back me up. Thank you for your patience and welcome back. "It didn't take long before bloggers began attacking and Matt Drudge's faithful army of right-wing, Red State readers began spamming our In-Boxes and conservative political blogs resumed their attacks on the "European left." So now anyone who does not agree with SPIEGEL's view of the world is a brainwashed zombie follower of Matt Drudge's "faithful army of right-wing, Red State readers." Let's make one thing very clear: You don't have to be American or conservative or from a red-state to be deeply upset by the callous, politically motivated reaction from European media - particularly left-leaning European media just like SPIEGEL ONLINE. For example, our comments section reflects the vigorous, and, at times heated, debate on gun control. There is, however, no debate as to the shameless and irresponsible nature of media coverage throughout Europe. UPDATE: "Journalist" Uwe Schmitt, correspondent for Die Welt - concludes an article on the killings with the line: "America is reaping what it sows." Can't he even wait until the dead are buried? Guess he is too busy trying to prove that American leaders are liars to the brain-dead Hate America audience to care. NOTE: Uwe Schmitt has "adjusted" his article and taken out the hateful last lines after massive complaint. Once again Tagesspiegel and other German media are reflexively exploiting a tragedy in America to peddle their pet issues like gun-control and Bush-bashing to a willing audience eager to degrade the United States at all costs. President Bush never said that everyone had the right to own a weapon - he simply defended his stance on gun control - but actually explaining the debate and Bush's actual stance on gun control is a little too nuanced for Germany's propaganda central. The forum question asks if Bush is right to defend the American right to bear arms. One SPIEGEL commenter left this entry: "Why sharpen (the gun laws)? You can't take away the Normal American's favorite toys as long as the Big American struts around with atomic bombs and aircraft carriers." Not much sympathy there for the American friends and the parents of the deceased. Comments like this are quite common on SPIEGEL forums - humanity goes right out the window. Wow. You compliment Die Welt for being a relatively balanced paper that avoids anti-Americanism one day and the same day they publish an absolutely freaky article on trigger-happy-American-special-forces-soldiers-convinced-by-Jesus-to-go-to-Iraq. No stereotypes there - right? DIE WELT Detects Apartheid in the U.S. When will there be a SPIEGELBLOG? 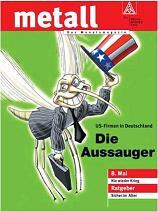 The German blog "Apocalypso" asks: "There is already a Bildblog; When will there be a SpiegelBlog?" Great question. We've been hoping something like that would come along as well. In fact, there is a new fledgling blog called "SpiegelKritik" that is worth checking out. Headline and photo of the story refer to a confession of the Hungarian President to have lied to the Hungarian public. The confession was unintentionally recorded during a secret session of his party. The unintentional recording was not mentioned in the summary shown above, though. > Head of government declares: "We have always lied in the last years." > George W. Bush, King of microphone glitches. The WELT online presentation connects optically the confession of numerous lies by a head of governement to George W. Bush's mic glitches. Daniel Hannan - member of the European Parliament (MEP) for South East England (Conservative) - has written a magnificient piece in Germany's daily WELT on migration movements within the European Union that border on the absurd. Daniel was kind enough to grant permission to present the original English version of his article in Davids Medienkritik. The European Parliament, it seems, has been swindled. We MEPs – or, rather, you taxpayers – have been paying €1 million a year over the odds to the city of Strasbourg. It is, of course, quite normal to over-invoice when dealing with the EU. Contractors know that Eurocrats are not spending their own money. They are like builders asking “Insurance job, this, is it?” – only on a far, far grander scale. What distinguishes this little scam, though, is that it reignites the argument about the location of the European Parliament. MEPs generally meet in Brussels; but, once a month, we travel Strasbourg. (We also maintain a permanent seat in Luxembourg, for reasons which are too complicated to go into now.) The expense of migrating between these places is awesome. Even when we factor out the cost of interpretation and translation, each MEP costs the taxpayer nearly €2.5 million a year. It’s not just the 732 MEPs who make the monthly peregrination, you see: it’s the chauffeurs, the committee clerks, the man who advises your secretary about her pension rights – oh, and some twelve tons of papers, shuttling back and forth in a dedicated train. The question of whether we should continue to meet in the chief town of Alsace tends to divide MEPs on grounds of nationality rather than political leaning. The British are sick of the place, largely because they hate having to put themselves into the inept hands of Air France every month. German MEPs, on the other hand, love it – apparently because they can travel for free within Germany, which allows them to take the train to Offenburg, be picked up there by a parliamentary chauffeur, and then claim a full fare for the journey. Welt am Sonntag, the Sunday edition of the conservative German daily Welt, published in its January 23, 2006, edition this excellent piece ("Dad, you burgeois, can I have the keys to the BMW?") by Marcia Pally. Her article addresses the hypocrisy in Germany with regard to the U.S. led war against terrorism. I obtained the original English version through Stefan Herre, who's blog "Politically Incorrect" I very much recommend to our German speaking readers. This is are links to Marcia Pally's home page and to one of her books. “Every nation has the government it deserves.” Joseph de Maistre, 1811. What did the Schroeder government know, and when did they know it? Since the disclosure of Bundesnachrichtendienstes (BND) activities in Iraq, these questions have percolated throughout Germany, along with a third: how much did they lie to us? These are important questions about government. But I am concerned with “us.” The responsibility for what the country does is not the state’s but ultimately ours. If we abdicate scrutiny of government, then we will get the Fuehrer we deserve. It is very dangerous for Germany, as for any democracy, to have one set of beliefs about what it is and does, and yet for the government to do something else--while the nation buries its head in its benign self-image. The German people were overwhelmingly against the Iraq war. The nation cheered when the Court affirmed the young soldier who would not fulfill a post which freed US soldiers for Iraq operations. This, said the public, is the principled people we are. Yet not only did BND operatives work on the ground in Iraq but Germany cooperated with the US in intelligence and logistics, offering Ramstein and other facilities. Last week the movie "Paradise Now" started in German cinemas. This critique in Germany's daily WELT (translation: Richard Bartholomew) pretty much sums up my feelings. I will post more on the subject next week. Suicide bombers are really good people: Alan Posener: The disappointing film "Paradise Now"
The next day the friends start out and although Khled gets cold feet at the last moment, Said goes through with it and blows himself up with a bus load of jews. Mission accomplished. Hany Abu-Assads film is the first fruit of the "World Cinema Fund", the mutual film sponsorship of the Berlinale and Federal Cultural Foundation. The evangelical film jury names "Paradise Now" as the film of the month because it invites the viewer to "think about the assasin's motives". Amnesty International distinguishes it with its peace prize because it's neither "lecturing nor moralizing". That's true: Noone in the film says that it might morally wrong (and not just politically conterproductive as Suha claims), to mass murder the innocent. As Said begs his commander for a second chance, he finds the words that Europeans miss so painfully in the communiques of the terrorists. Words that speak to the heart - just like Saids' gesture speaks to the heart not to board a bus carrying a sweet israeli child. That's how they are, these murderers: actually good people. But the film doesn't show Saids'deed: Women without abdomens, men without heads, children without arms and legs, blood and guts in seats, burned pieces of flesh all over the place. Nothing about that: After panning past Saids' eyes the screen becomes bright and white and pure. At the 55th international film festival in Berlin 2005 "Paradise Now" won the Publikumspreis ("audience award") and the Blue Angle for the best European film. Journalists: Useful Idiots for Terrorists? Here is another gem from Berlin Aspen Institute's Jeffrey Gedmin...the original English version of the article that was published in Tuesday's "Welt" in German. I had planned to publish the piece earlier, but then had to delay it because of Katrina. Katrina is still at the forefront of our thinking, but I think Jeffrey Gedmin's voice needs to be heard under any circumstances. In an article entitled, America’s Friends and the Internet, author Hannes Stein of Die Welt, a major German daily newspaper, finally does what many in the German media have long refused to do: He delves into the world of German bloggers fed up with the "majority opinion" in Germany. And to his credit, he does so without attempting to smear, dismiss or belittle his subject as others have done in the past. That is a nice enough introduction. Clearly, the author also possesses a keen sense of sarcastic humor: After all, how many people in Germany still have "red or green stars" dancing in front of their eyes? The current red-green government of Chancellor Gerhard Schroeder has been one of the most unpopular post-war governments in German history for years now. If the article has one major flaw though, it is that it oversimplifies a number of issues. For one, it leaves readers with the false impression that blogs like ours are unconditionally uncritical of the United States and George W. Bush. Just to be clear: The unconditional, uncritical support of the United States, George W. Bush or neo-conservatism has never been what we at Davids Medienkritik are about and never will be what we are about. We believe that the United States, like any other nation, needs to be frequently criticized and challenged on the issues. We believe that American conservatives, including members of the Bush administration, must be regularly confronted with opposing ideas and called-on to defend their own, just as members of the German mainstream media must be regularly confronted with opposing ideas and forced to defend their own. We believe that rigorous, critical, constructive debate is an absolute necessity in any democracy. We believe that the media plays an important role in the furtherance of such debate. 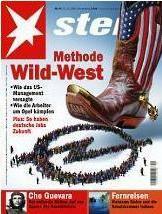 What we at Davids Medienkritik object to is the simplistic, propaganda-like demonization of the United States, George W. Bush and conservatives in German media and society. We object to the fact that American conservatives are repeatedly smeared and dismissed in Germany without the slightest examination or consideration of their arguments. We object to the fact that conservatives are rarely given a chance to express their views in a fair, constructive and open forum and rarely listened to or engaged in a substantive dialogue. We object to sweeping portrayals of Americans as Fascists, militarists, idiots, torturers or blood-sucking capitalist insects. We object when the German government begins to compare human beings to parasites in an attempt to get elected. We object to the obsessive cataloging of alleged American war crimes and capitalist transgressions by the very same people who condone -and do business with- the world's most brutal dictatorships. We object when the German media refuse to listen to conservative ideas, yet interview one left-wing "Amerika Experte" after the other, after the other. We object to the German "majority opinion", fostered by the German media and some members of the German government, that America is to blame for many of the world's problems and that George W. Bush is a stupid, militaristic semi-reincarnation of Hitler who dominates American society and media. The above quote is a microcosm of the entire article. It begins by pointing out something useful: Many Germans, who pride themselves on nuanced thinking and the keen ability to sense all shades of gray, have fallen victim to a cheap and overly-simplistic view of George W. Bush as a stupid, war-mongering cowboy. To set the record straight: This blogger has always cared about the issue of weapons of mass destruction and, in relation to that, Saddam Hussein’s refusal to comply with over a dozen United Nations Security Council resolutions calling for his disarmament over the course of a decade. Many bloggers - like many governments, including those of France and Germany - believed that Saddam Hussein possessed, or at least sought to possess, weapons of mass destruction right up to the commencement of military action against him in 2003. Saddam's stubborn refusal to fully cooperate with the United Nations inspectors in accordance with international law seemed only to confirm those fears. Like me, many bloggers were deeply concerned about the prospect of a Saddam Hussein with weapons of mass destruction in a post September 11 world. Put another way: Mr. Stein's assertion that we collectively did not care about weapons of mass destruction is simply incorrect and inaccurate. But we at Davids Medienkritik don't want to be too hard on Mr. Stein. We are delighted that he labels our website one of the "central stars of the pro-American parallel universe on the internet," and acknowledges the work of several other outstanding blogs including Achse des Guten, Senordaffy, A New European, No Blood for Sauerkraut, Statler & Waldorf and Anti-anti-Americanism. And again, Mr. Stein's article is a giant step in the right direction in that he has actually made an attempt to explain and understand blogs like ours and the people and ideas behind them. He correctly indicates that what we bloggers really want is not consensus, but a discussion as to whether the "majority opinion" in Germany is right and fair. Ultimately, what most bloggers want is a dialogue in Germany and across the Atlantic without the blinding lights and the blaring horns of an ideological media shutting down the conversation. Matthias Doepfner, Chief Executive of German publisher Axel Springer AG, is one of the most vocal critics of the new political agenda that is so widely shared in German politics, the media and the public: tolerance for anti-Semitism, sympathy for anti-Americanism, skepticism towards capitalism. Our translation of his brilliant piece "Europe - Thy Name is Cowardice" was one of the all-time favorites for this blog's visitors (more than 20.000 on a single day!). The sum total of what we learned from World War II is, “War? Never again!” More important lessons would have been, “Fanaticism? Never again!” and “Racism? Never again!” and “Dictatorship? Never again!” In light of this historical background, German tolerance for aggressive anti-Semitism in the parts of the Middle East is astonishing, since supporting Israel and the security of its citizens should be a given. German sympathy for anti-Americanism before and since the war in Iraq is remarkable, since friendship towards the Americans, to whom we owe Germany’s reconstruction and independence after 1945 as well as the 1990 reunification should be a tenet of common decency. But Germans’ deep-seated skepticism towards the free market, towards capitalism, is most irritating. The docudrama “Speer and Him” has a scene, set in the basement of a brewpub, in which Hitler enthuses his unemployed and despairing listeners with one main thesis: “Materialism must naturally be overcome by idealism.” This fine-sounding promise started it all – and its power to fascinate lives to this day. Groups at the political periphery take advantage of its power. Pride in one’s nationality slips over the edge into nationalism when patriotism turns into xenophobia and social responsibility turns into socialism when seeking justice turns into mad demands for total equality. The issue of whether National Socialism is rightist or leftist is only superficial – a matter of painting it’s façade black or red. The 8th of May was the day of Germany’s defeat, a defeat that many considered a liberation by the Allies. However, it wasn’t a real liberation. We must liberate ourselves. Only the future will tell if we’ve truly accomplished that self-liberation. DIE WELT: When George W. Bush visited Europe a few weeks ago, he spoke of a new era of transatlantic relations. Many Europeans were skeptical, suspecting more style than substance. Is this mistrust justified? Kissinger: Anyone familiar with President Bush knows that he means what he says. This differentiation between style and substance is out of place. Bush made an honest attempt to improve transatlantic relations. Now the ball is in the court of the Europeans. A true partnership can only develop if both sides are willing to scrutinize their own positions and make concessions. But many Europeans in fact continue to insist that the US president demonstrate his good will every day - without themselves saying what they are willing to do in exchange. 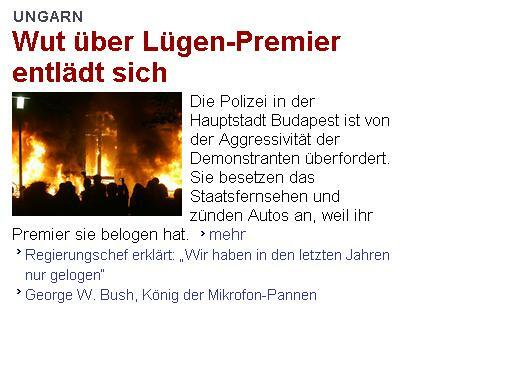 DIE WELT: Why do Europeans dislike Bush? Warning Labels for Biased Articles? (I should mention that we now can offer the original English version of Jeff Gedmin's WELT article that was sent to us by the Aspen Institute Berlin. Many thanks to them and to Hartmut Lau who provided the English translation of the first version we presented). I hate over-regulation, but I wonder whether journalism needs what the food industry has. I like being able to read the label to know the ingredients in my juice or tomato sauce. Why shouldn't I know more about the news I am consuming? I think about this when I consider much of the one-sided reporting on Iraq. The United States is no exception. I came across an interview recently with Rod Nordland, the Baghdad bureau chief of Newsweek magazine. Asked why we should be optimistic about democracy in the Middle East, Nordland says, "Who's optimistic?" Asked why Bush cares about the people of Iraq, Nordland says, "Who says he cares?" Nordland has strong opinions. Me too. But Nordland is in the news business, so why not disclose in his by-line, "Mr. Nordland opposed the Iraq war, thinks Arab democracy is an illusion, and believes George W. Bush is heartless and cynical." At least there would be no pretending about neutrality and objectivity. I think about this when I consider the one-sided reporting in Germany about the United States. Take the Berliner Tagesspiegel. The paper's correspondent writes for the news section and publishes columns on the opinion page. I often find it hard to tell the difference between the two. Sometimes the news stories are so opinionated I yearn for a label, like "Malte Lehming thinks that the president of the United States is a war-mongering ayatollah whose conservative-religious revolution is destroying American democracy." Columns and documentary films should be no exception. Why not have a box score, like in American baseball? "Jeffrey Gedmin was batting 300 in 2004"-that's being right one out of three times. Maybe a second line could attest to the accuracy of the facts that underline our arguments. This should apply to political documentaries, too. The most notorious in this business is America's Michael Moore. He preferred Saddam Hussein in power. Last year he was cheering the Iraqi insurgents to kill as many Americans as they could. That's free speech, however repugnant. But then there are those things we call facts. In Fahrenheit 9/11 Moore asserted that the White House approved special charter flights for bin Laden family members to leave the US, without being interviewed by the FBI and while US airspace was still closed. But none of this turned out to be true. Moore also asserted that the Carlyle Group, a business with ties to the Bush family, profited from September 11th because it owns United Defense, a military contractor. But United Defense's jewel project of the time, an $11 billion artillery rocket system, was cancelled by the Bush administration. Maybe a label should warn, "this product could be dangerous to your mental health." Maybe journalism should have something akin to a driver's license. Break enough rules, endanger public safety, you get your privileges revoked. Ok, free press is a right. I oppose all forms of censorship. You're safe, Michael. You can run those red lights and still drive on the side walks. In truth, though, the rest os us could police ourselves a bit more. I recall a journalist from a top daily once telling me he was struggling with a story about Jürgen Möllemann, because he found it so hard to keep his own views out of the story. For news, that's surely a model. Until then, why not stick a label on the by-line of that next Iran story, "John Doe thinks American foreign policy is neo-imperialist and personally does not understand why the Mullahs should not have nuclear weapons." Jeffrey Gedmin, director of the Aspen Institute Berlin, gets not a dime from the U.S. government, but wishes someone in Washington would reconsider. ...you need to have a deeply ingrained anti-American sentiment to become Washington correspondent of a German media outlet. Credentials as a journalist? Well, let's not be too demanding... Malte Lehming is definitely superbly qualified for the job.